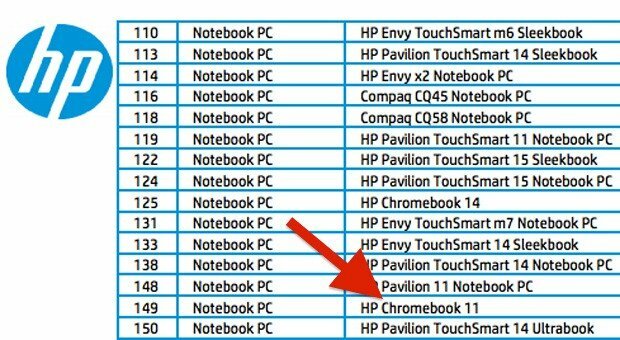 Chromebook 11 from HP on the way?! Leaked HP documents have shown that an 11-inch Chromebook might be coming down the pipe. Thus far all Chromebooks have sported 14-inch screens, but a mention of a “Chromebook 11” on PC builder’s Energy Star qualification list and a support page for the device, which is mostly blank at the moment, point toward the smaller Chromebook’s existence. One of the key draws of a laptop is its portability. It might mean a smaller screen, but it’ll be a much more portable device. In today’s world of smartphones and smartwatches, an 11-inch screen should definitely big enough to work with. Google is slowly becoming a third computer technology giant to rival Windows and Apple. It’s already as big as either company and somehow has the resources to offer better technological devices than both at a fraction of the price. I’m not saying that’s particularly the case with the Chromebook – I personally don’t care to use Chrome OS – but it’s a sign of things to come. Who’s excited for an 11-inch Chromebook?